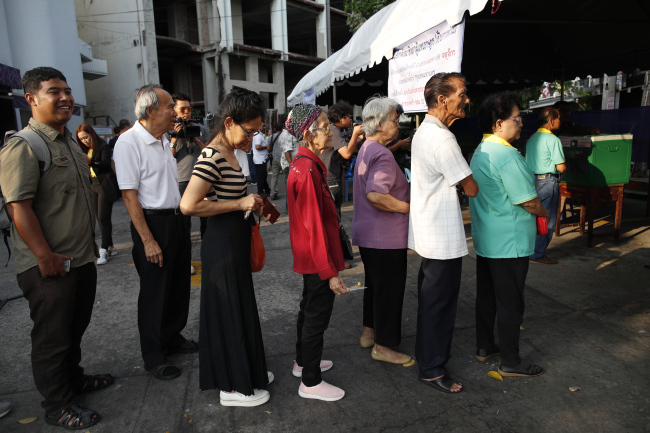 BANGKOK, March 24, 2019 (AFP) - Polls opened Sunday for the first Thai election since a 2014 coup, with a high turnout expected among a public who received a cryptic last-minute warning from the Thai king to support "good" leaders to prevent "chaos." All television stations repeated the rare statement by King Maha Vajiralongkorn moments before polls opened across a politically turbulent country. Sunday's election pits a royalist junta and its allies against the election-winning machine of billionaire ex-premier Thaksin Shinawatra and an unpredictable wave of millions of first time voters. Politicians across the spectrum fear a stalemate has been booked in by new election rules, written by the junta, which limit the chances of any single party emerging with a comfortable parliamentary majority. "People want to vote, they are excited," said businesswoman Apiyada Svarachorn at a Bangkok polling station, adding the public remains "split into two sides." The statement reiterated comments by late king Bhumibol Adulyadej from 1969 calling for people to "support good people to govern the society and control the bad people" to prevent them from "creating chaos." His heir, Vajiralongkorn, urged the public to "remember and be aware" of the remarks of his father, who died in 2016. The king called on the general public, the military, police and civil service to heed the words of his father. "His majesty is concerned about the stability of the nation, the feelings and happiness of the people," the statement added. Thailand is a constitutional monarchy. But the palace holds unassailable powers and is shielded from criticism by a harsh royal defamation law. Thaksin has lived in self-exile since 2008. But he looms large over the election and his affiliated parties have won every Thai election since, drawing on huge loyalty from rural and urban poor. On Friday Ubolratana was guest of honour at the glitzy Hong Kong wedding of Thaksin's daughter -- with photos of the tycoon and the princess hugging and smiling going viral. The top trending hashtag on Thai Twitter on Sunday was #oldenoughtochooseourselves. The Shinawatras say they have simply recognised the economic and democratic aspirations of the majority of Thais, reflected in their landslide election wins. New demographic forces have complicated the normal split between pro-and anti-Shinawatra factions. Seven million millennials are eligible to vote for the first time.